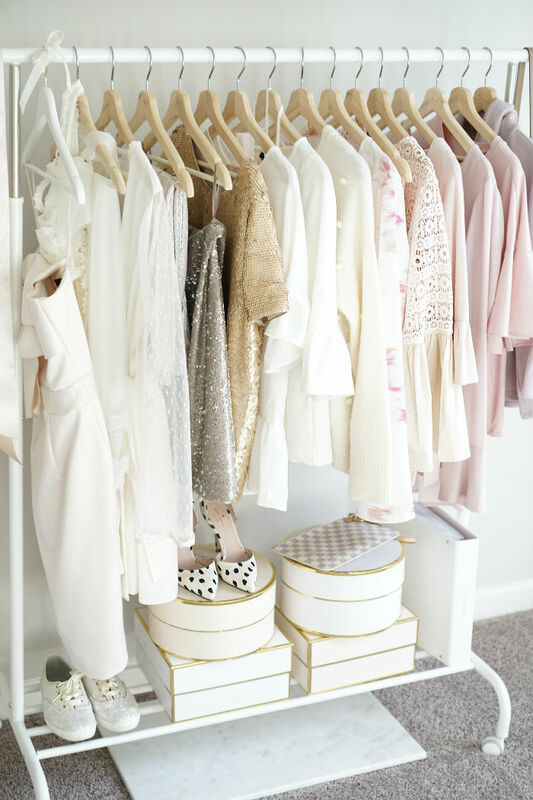 When you first walk into the room, I have a clothing rack to keep new purchases and organize outfits to style so they don’t get lost in my closet. I didn’t need a fancy clothing rack, so I opted for this cheap one from Ikea ($12). 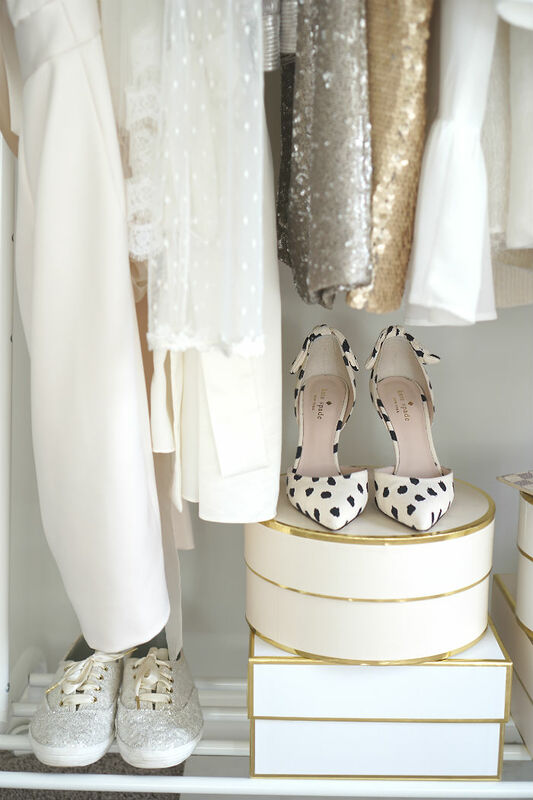 Just like my closet, the pieces are organized by color to be appealing to the eye. When I’m prepping for shoots, I like to put complete outfits together and hang all the accessories going with them so I don’t leave anything out. Of course, even if you’re not a blogger you can benefit from a clothing rack. 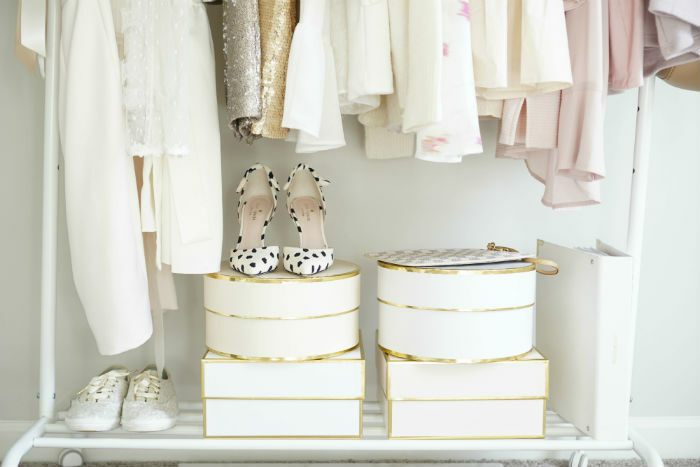 Use your’s for extra storage and inspiration to avoid wearing the same outfit over and over. 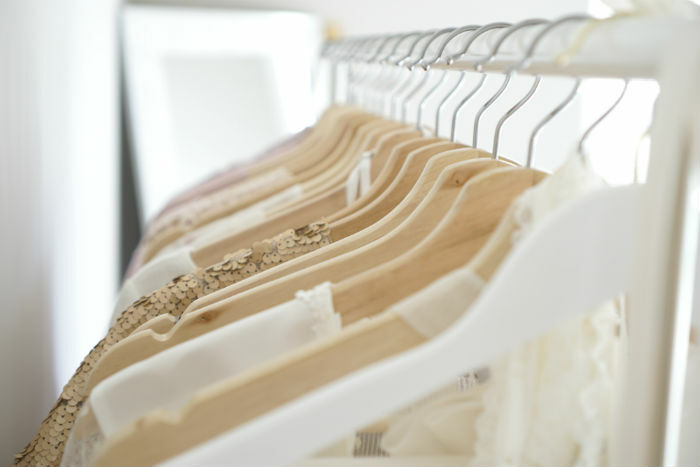 It also helps me get ready faster because I can easily find all my favorite pieces. 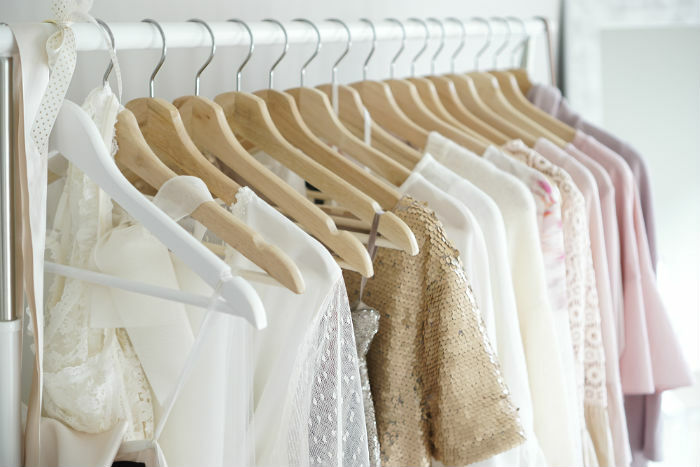 I still have a little holiday sparkle on my clothing rack, because the pieces are too pretty to be hidden in my dark closet! You can see I’m ready to transition into spring with lighter whites and pinks. I’m loving tops with feminine details on the sleeve including ruffles, peplums, and cut outs. I’ve linked as many tops as I could at the end of the post! I purchased the wood hangers from Ikea while I was there because I couldn’t beat the $4.99 price tag. The total to put together my clothing rack was only $21 plus tax, so you don’t have to spend a lot to put something together! 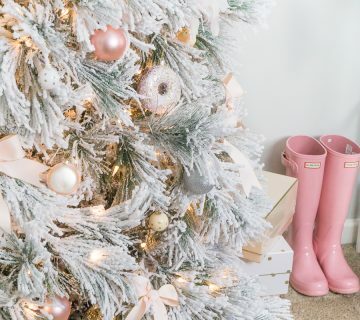 You may recognize the white and blush boxes from my holiday photo shoot. They’re from the Paper Source + Target holiday collection and I purchased them for storage. Inside, I have winter hats and gloves, along with just random junk that doesn’t have a home. To the right, I have my wedding planner, and to the left, I have my wedding reception shoes along with my reception dress and robe. 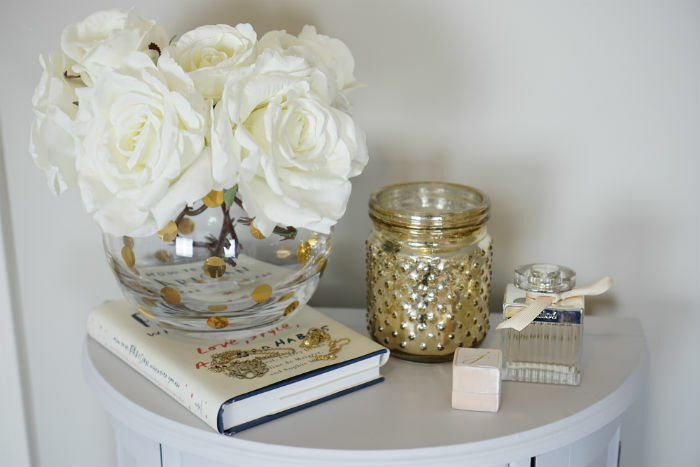 Read about my wedding accessories here, plus there’s a video about them! This is the mirror where I take quick selfies of my outfit, though I haven’t been doing that recently because I prefer to have my Instagram husband take them for me 😉 The lighting is usually not optimal in this room when I would need to take those pictures (in the morning before work). If you’re wondering where the frame is from, it’s custom from my family’s art gallery. The white rug is a HomeGoods find and I always seem them in there! A little tip – compare a few side by side to get the whitest one. I’ve had this Ikea desk all throughout PT school, so it’s been through some studying for sure. It’s actually larger than it looks in this photo, but I enjoy never running out of desk space. My makeup was previously stored in the left drawers, but I decided I needed the extra space for storage. 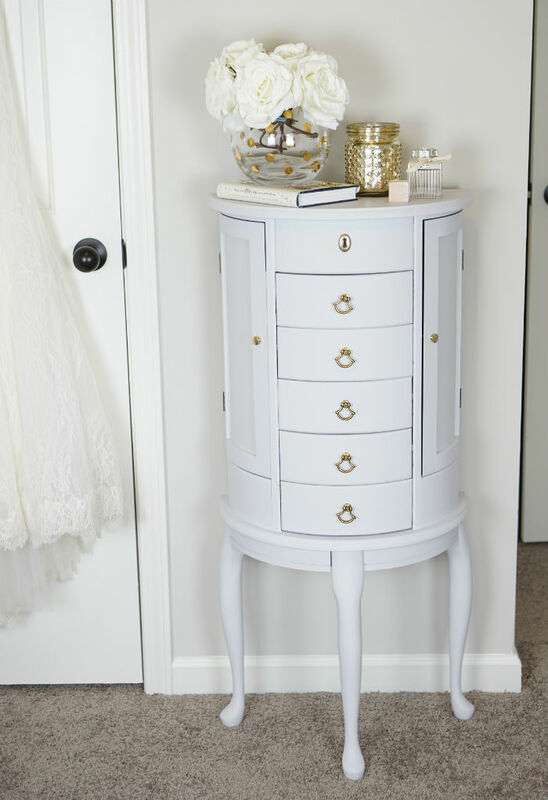 I found this GLAMbox look-a-like from HomeGoods but I’m still feeling out whether I like the cluttery look of it. Though it does help me see and use different products more frequently! I recently purchased this desk calendar to help plan out my posts, but mostly to prevent all my makeup from staining my white desk. It was getting old using a magic eraser every weekend! The vase with our wedding date was a gift from my MOH. It’s sad how happy seeing all those perfectly even numbers make me, haha! Am I the only one who had to get married on an even date? Just me?? Also random story- I’ve been looking for the SanDisk reader in this picture all weekend… grr! My new Macbook doesn’t come with any ports (cool, Apple), so I can’t upload a new video until I find it. My zebra trinket dish is currently not available online from Francesca’s,but I linked the original designer below. I always use cute coffee mugs for storage and I’m not really sure why, but it works. I also have my makeup brushes in one. I may do a future post on my makeup collection + storage. Let me know if you’d like to see it! 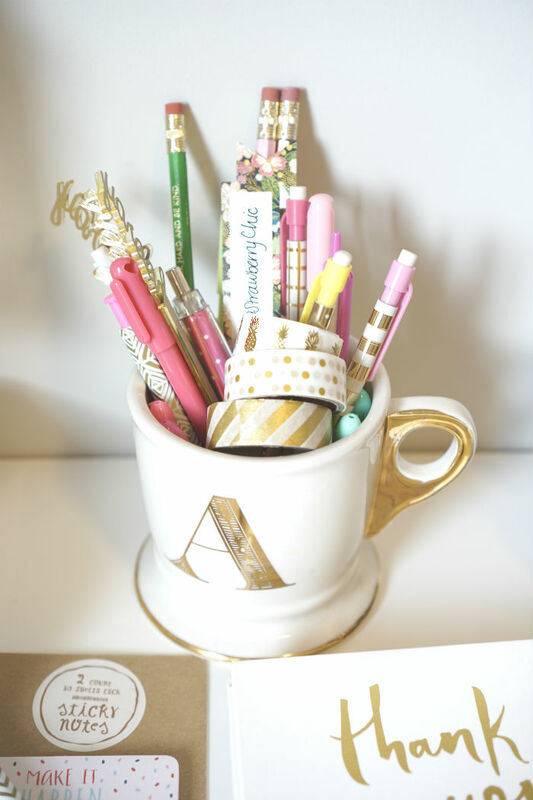 Washi tape is great to always have on hand. I purchased mine from Target and Hobby Lobby, and use it when planning all the time. I also used it in my wedding planner to stick on inspiration and I could switch it out as needed. Another Ikea purchase that I’m sure you’ve seen sprayed gold in other office tours. I went the lazy route and decided it was fine white, but I did want to cover the wood base with cheap marble contact paper, which was super easy to do. I had to make two Ikea trips for this bad boy because the first box had a huge dent in the unit, but that’s what you get with Ikea. This is definitely the space that changes most in my office because I’m always re-organizing it. At the top, I store my framed DPT diploma with my most used clutch. 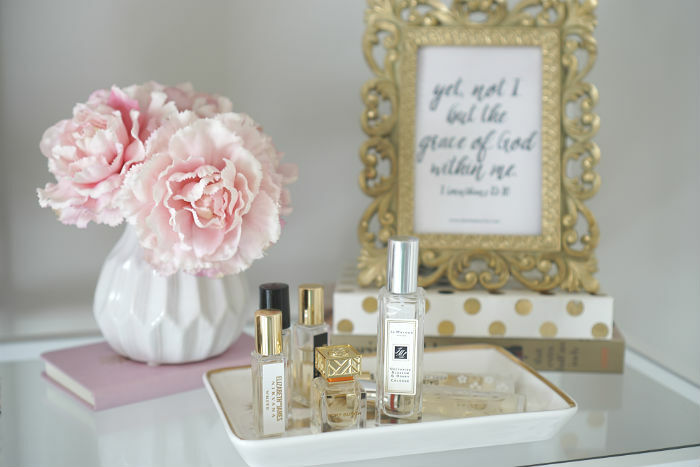 On the right top shelf, I have a tray of smaller perfumes and samples, my vows, some fake florals from Hobby Lobby, and a printed Pinterest quote (shameless plug in – follow me on Pinterest here). 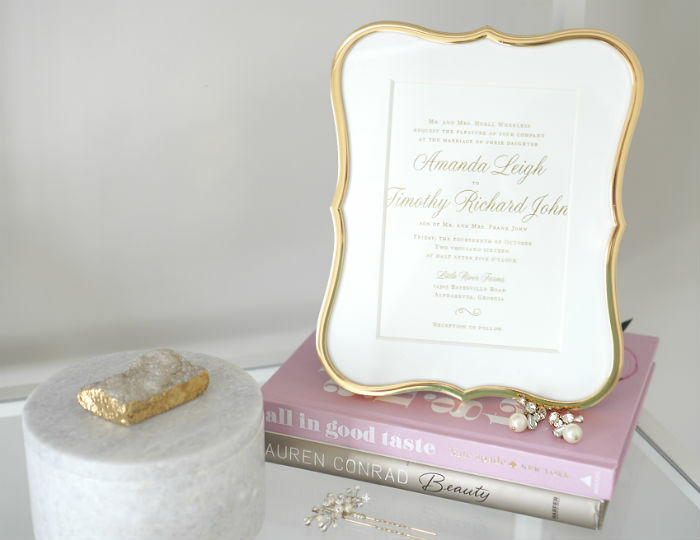 On the second shelf, I have a few wedding items on display including my shoes, the cards from our guests in the clear gold case, and a framed invitation in this pretty frame. The second to last shelf is where I’ve stored a few nail polishes in a cute gold scallop container and my sunglasses inside an acrylic tray I won at Swoozies during a raffle. Along the bottom shelf I store clutches and two of the bags I use more frequently. I found the clutch organizer in the office section at HomeGoods, and it was one of those things I’ve been on the hunt for a while! That wraps up today’s office tour! 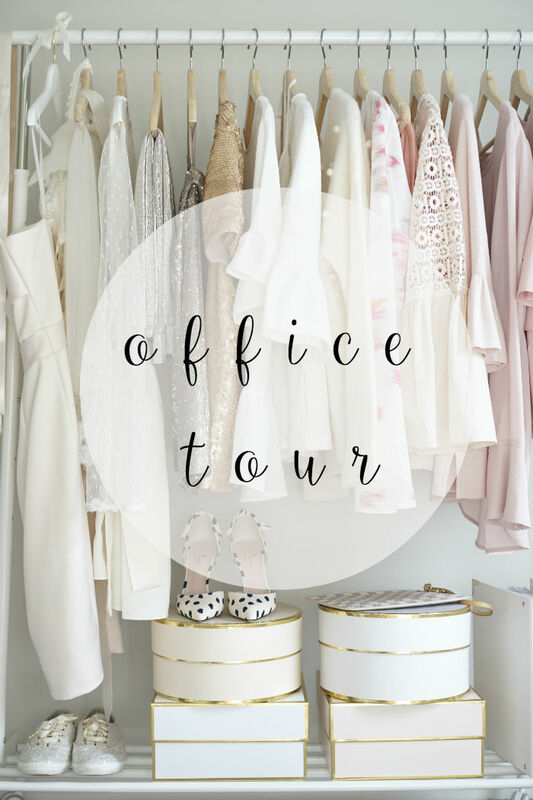 I filmed a short video of my office tour and picked out my favorite pieces on my clothing rack. Check out the video on my new Youtube Channel, here! I will try to link everything I can here, but not everything is still available. If you have a question about a particular piece, let me know in the comments! 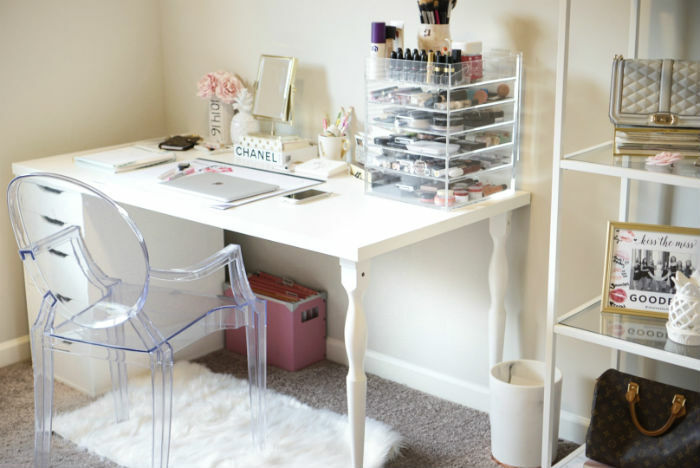 Your office is just so cute! I love all the details here. 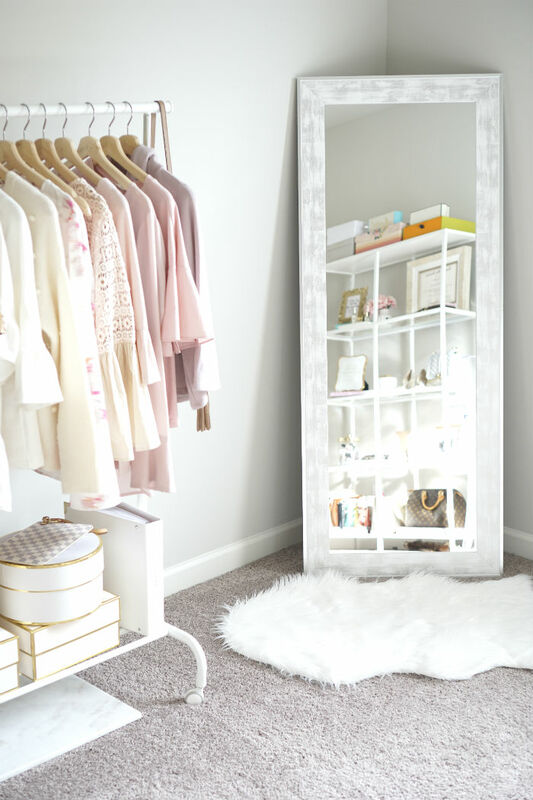 I've been looking for a clothing rack and that one from IKEA is perfect! This room looks so dreamy! You did a great job making this space beautiful and work-friendly! Such an inspiring space. Your office is so pretty!!! I am loving all the detail and its sooo perfect. Literally OBSESSED with this room! I love your clothing rack set-up and the jewelry chest that was your moms! I seriously just Pinned EVERYTHING! OMG girl you must be so proud. What a beautiful office! ummmmmmmm this is like the most gorgeous space ever!! 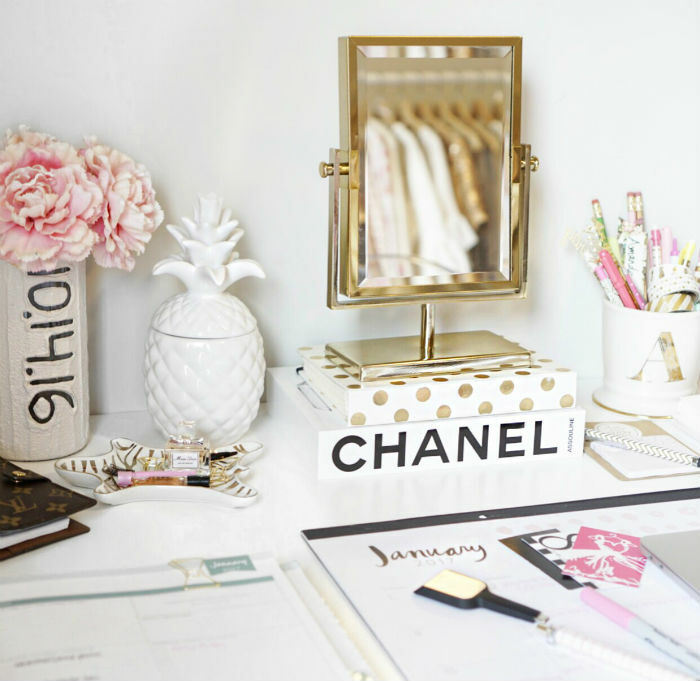 Your office space is so gorgeous! 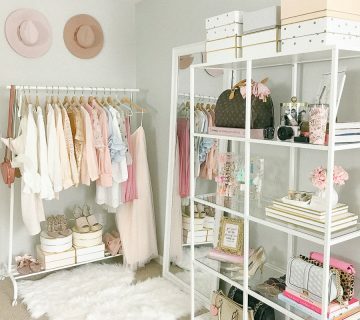 I absolutely love the shelves you used for your bags! Alright first off this post is GORRRRGEOUS. But actually I want to be weird and comment on the fact that OMG WHY DOES APPLE NOT HAVE PORTS ON THEIR NEW COMPUTERS?! I went to buy a new laptop today (#upgrade) and I was almost sold on the new macbook pro until I realized I'd have to buy a ton of port adapters! So crazy!